A Japanese garden was officially opened this week in the grounds of Domaine de la Celle Saint-Cloud in Paris, the castle used by the French Foreign Ministry as a guesthouse. The garden’s completion marks an integration of Japanese and French cultures, French Foreign Minister Laurent Fabius said at a ceremony Wednesday, adding that ties between the two countries will get stronger. Events focusing on traditional Japanese culture were also held at the opening, including gold leafing demonstrated by Japanese and French artists and a performance of the koto Japanese harp. The castle has been the ministry’s guesthouse since 1951. The construction of the Japanese garden was undertaken by Beppu Shofuen Co., a garden designer based in Fukuoka, which started preparations in June 2014. Fascinated by Japanese culture, Fabius’ de facto wife, Marie-France Marchand Baylet, asked Beppu Shofuen to build it through the Japanese Embassy in Paris. She knew the Japanese company created a garden in Monaco. At the ceremony, also attended by Tokyo Gov. Yoichi Masuzoe, who is visiting France, Fabius awarded a medal to Beppu Shofuen Chairman Yasuo Beppu. Explaining that the garden comprised many rocks and trees found on the grounds of the guesthouse, Beppu said it was not easy to have the French materials fit into the Japanese scenery. Photo: Tokyo Gov. 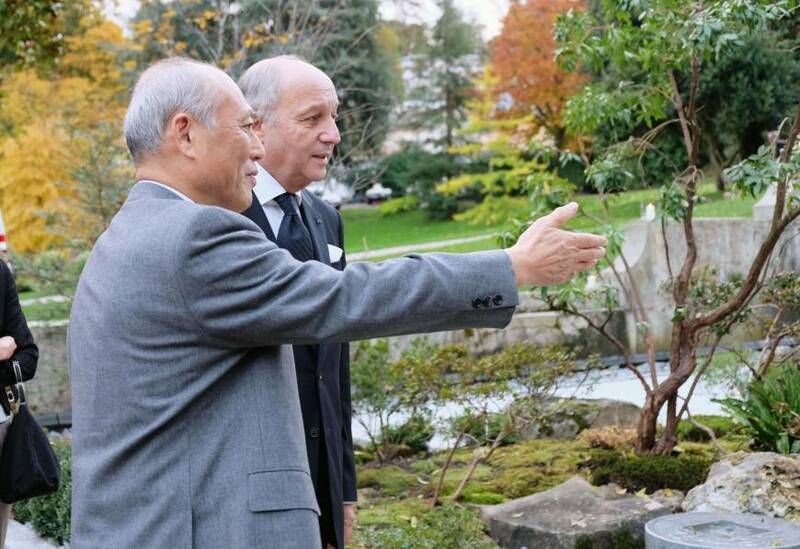 Yoichi Masuzoe observes a newly completed Japanese garden in Paris with French Foreign Minister Laurent Fabius on Wednesday.